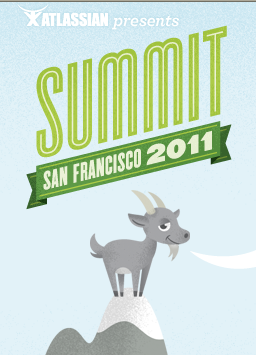 Last week I attended the Atlassian Summit 2011 conference, held in San Francisco at the Intercontinental hotel. I was a newbie (first time attending this particular conference), but had a fantastic experience. My path to attend this conference was unusual. Normally you hear about great conferences and are sad to have missed out on the experience. Not so with Atlassian! After last year’s summit, Atlassian posted videos from all the sessions. Anyone could view the videos and get some free training. What a great move! It showed off the quality of sessions and (in my case) built my business case for attending the next event. The keynote sessions provided real value and real humor. We expected Atlassian to announce product changes/upgrades. But announcing the right updates with the right level of detail couched in Star Wars speak is a winning combination. These aren’t just techie nerds–they’re techie nerds with a sense of humor that the broader public can understand and appreciate! Confluence version 4.0’s new rich media interface. Gone are the days of Rich Text vs. Wiki Markup. Atlassian has rebuilt their Confluence interface to store data in XHTML format. As you type, the new editor will auto-format and invoke your rich text features. Want a level 1 heading? Just type “h1” at the beginning of your heading and Confluence will automatically apply the correct formatting and remove your “h1” text. Beautiful! The LaunchPad event. Atlassian gave a bevy of sponsors the opportunity to get in front of the entire conference for a 5-minute sales pitch. There’s a catch, though…attendees got the chance to vote on each vendor, rating them as “the next great thing” or “the next great disaster.” Votes are tallied and displayed immediately, putting the pressure on sponsors to be entertaining, informative and cool under pressure. This was a fantastic way for newbies like me to see the spectrum of third-party players while keeping things fun and interesting. Great job! The AtlasBar. Let’s face it, I came here with questions. And I needed answers. Fortunately, Atlassian had a bevy of support techs on hand to handle walk-up questions. I was able to get in, get my questions answered AND talk features and application use quickly and easily. All without missing any sessions. Love it! From where I stand, Atlassian only had one big miss with this event. While Atlassian has done a good job building connectors and plugins to work with Microsoft products, they undersold this work too much. And a couple of Atlassian folks spent too much time Microsoft bashing. I understand zealous feelings for (and against) certain software providers, but I manage to rise above and enjoy using the best features of my iPhone and SharePoint all in the same day. Many of the attendees I talked to are trying to figure out how to use a variety of tools (including SharePoint, Microsoft Office and Confluence) on a daily basis. Atlassian needs to remain focused on making their customers’ lives easier–not criticizing or ridiculing them for using products they have a personal aversion to. All in all, though, Atlassian did a fantastic job. This is a conference I’ll definitely recommend to others. And I’ll be a repeat customer.